I was on the Acoustic Guitar Magazine forum the other day, sharing my thoughts on the Guitar Tool Kit for the iPhone. One mentioned that this program was yet another reason to buy the new iPhone. 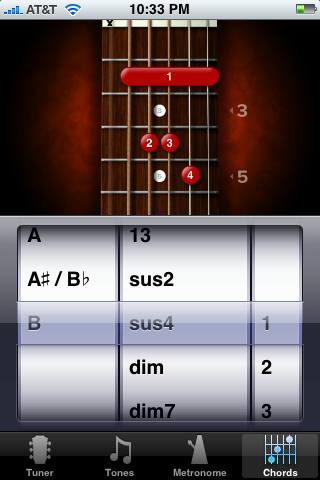 I wouldn’t go that far but if you have an iPhone or iTouch , the Guitar Tool Kit is a handy program to have around. 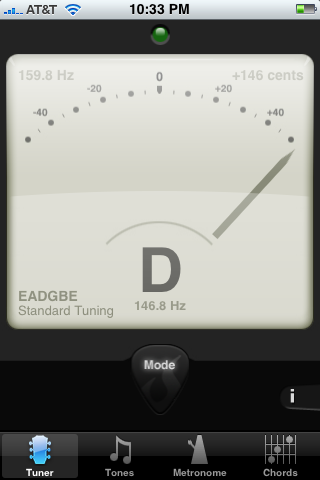 Tuner: Has many different tuning modes from standard tuning to modal or open tuning. Initially, I tried the tuner on the 1st Gen iPhone and it didn’t work so well. The response was terrible and wouldn’t register the low E string and was rendered useless. I now own the 3G iPhone and the tuner is working much better. I’m thinking that the 3G has a better microphone. Any thoughts on this? As a test, I set my Korg tuner next to the iPhone to see how close they responded and the tool kit did very well. The tuner does not work on the iTouch because of the lack of a microphone. 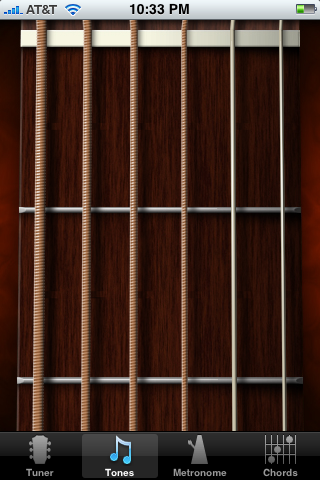 But you can use the “Tones” option which is a graphic representation of the six strings and you can run your finger over each string to act as a reference. 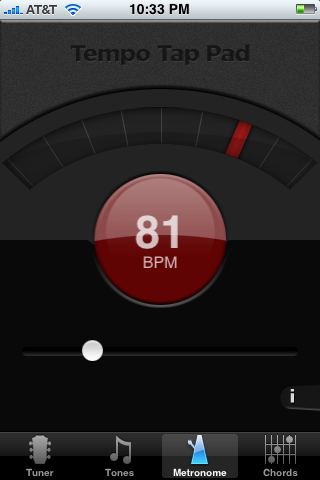 Metronome: My first impression of the metronome was annoyance. The tones for the beats sounded like a trash can and there was no way to change those tones to something more pleasant. After I installed the update, the option to to change the tone was there so now the metronome is usable and quite nice to have. The current version of the tool kit only offers 2/4, 3/4, 4/4 and “no time signature” as options for time signatures. I would like to see a way to customize the time signatures and even an option on where you want the accents within the measures. Chord Chart: Very handy little program with lots and lots of chord s for you to reference. What is nice is that you can move up and down the fretboard to get your desired chords in different positions. I would like to see is an option to illustrate where the root of the chord is located on the chart. Even better, the 3rd, 5th, 7th etc… location as well. So would I recommend this program? Definitely! It’s not going to replace your current equipment but at only $9.99, it’s nice to have when you’re on the go and need something in a pinch. Regarding tuner performance, GuitarToolkit is currently on its third iteration (version 1.1.1), and we made significant improvements to tuning in each new version, so perhaps this rather than 3G versus original iPhone is the source of the improvement in tuning fidelity. We haven’t noticed a difference between 3G and original for tuning fidelity. Regarding metronome sounds, if you have the latest version (updates are free and should be automatic), you will see the option to change the sounds to something less annoying than what we now call the “dreaded cowbell.” The time signature improvements are under consideration for a future release. Again, thanks for the in-depth review. Thanks for clarifying on the tuner issue. I was pretty sure it was the update but now I know. I’m looking forward to your next update. None that I can see. 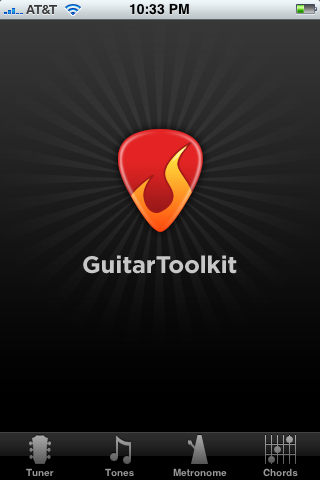 You might want to contact the guitar tool kit peope directly to find out if that might be in their plans.